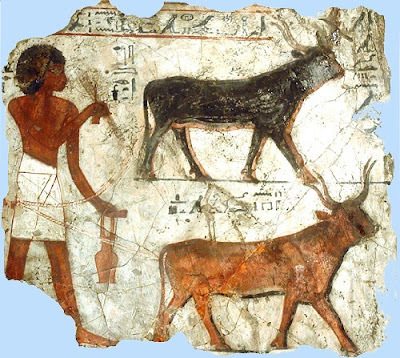 In ancient Egypt the land and the river were inextricably linked , for without the annual inundation which irrigated and fertilized the soil, neither the prosperous economy nor the rich civilization which it engendered could have existed. 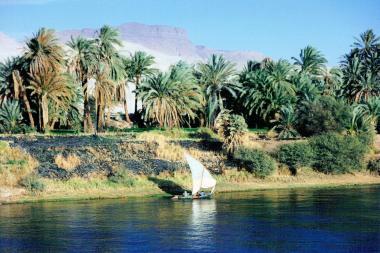 Furthermore, the Nile was the main highway of the country . Until the New Kingdom, transport on land was virtually non-existent. Donkeys were the only beasts of burden and travelers had to walk or be carried in a litter. The inundation , which no longer affects Egypt since construction of a series of dams and sluices from Aswan northwards , occurred during he summer, from July to October. It began with the fall of rain in central Sudan, which later, summer monsoon rains falling over the Ethiopian highlands caused a rapid swelling of the Blue Nile and the Atbara tributary. 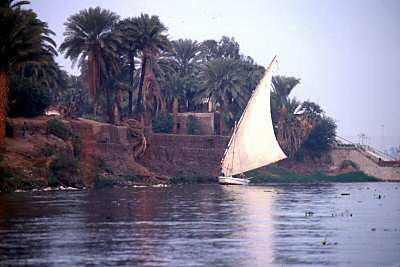 this excess of water reached Egypt in August, causing a dramatic rise in the level of the river. During late August and September the hole valley was flooded, apart from the higher areas of land on which the villages and towns were built. A fertile layer of silt was deposited over the fields and the parched soil was well soak. The level of the inundation as crucial. If there was not enough water. Insufficient ground would be prepared for the next season's corps and famine could ensue . To much water caused severe damage to houses and dykes. The height of the flood could be predicted in advance using Nilometers constructed at various points along the river. By comparing the rate of rise with records kept over many centuries, the farmers would know whether to except famine or plenty, or if they should move their belongings in a hurry. As soon as the waters began to fall, the agricultural year began. First of all the fields had to be put back in other . This involved the repair of dykes and irrigation channels, the re-establishment of land boundaries and preparation of the soil. The re-establishment of field markers was important , not only to prevent legal wrangles over ownership of property, but for the assessment of taxes later in the year. To ensure that these essential tasks were carried out, the Corvée system outlined inn the previous chapter was instituted at a very early date. The unpleasant nature of the work led all those who could afford it to supply a deputy. Once preparations were complete, the fields could be planted. The staple corps were emmer wheat, barley and flax. The cereal crops were for making bread and beer and the flax provided linen, from which the Egyptians made most of their clothes. Flax could be harvested at different times , depending on the use to which the fibres were to be but . The fibres from a young plant made fine thread, while those from a ripe plant were suitable for heavy fabric, rope-work and matting. The heads were removed by pulling them through a long comb-like tool and were used for seed, or possibly the manufacture of linseed oil, The stems were soaked to separate the wood from the fibres, then beaten to remove the wood, after which the fibres were combed out for spinning.